This looks promising. I like the “age appropriate” costumes, but Supergirl is still in a skirt! Girls can like superheroes too. 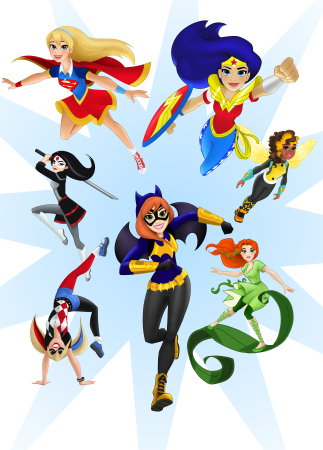 DC Entertainment and Warner Bros. have heard the rallying cry of geek women everywhere and are launching “DC Super Hero Girls,” a new universe featuring some of their most iconic female characters re-imagined for girls ages 6-12. The announced lineup includes Wonder Woman, Supergirl, Batgirl, Harley Quinn, Bumble Bee, Poison Ivy and Katana (redesigned in age-appropriate attire, of course), a combination that will allow girls to explore their affinity for both superheroics and supervillainy.